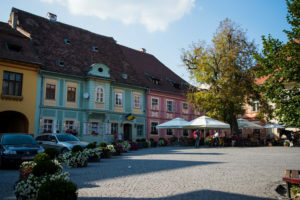 Sighișoara is a medieval citadel in the Transylvanian region of Romania. 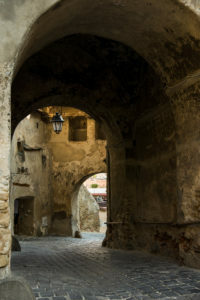 It’s one of the best preserved medieval towns in Europe and with it’s charm became a UNESCO world heritage site. This small fortified city was built by the Saxons in the 12th century. 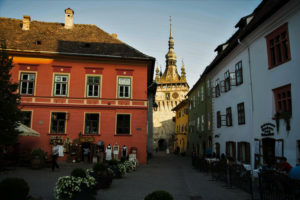 The old town is situated in the hilltop citadel and is mainly pedestrianised, with ice cream coloured houses which are full of history, cafes and other amazing places to visit. 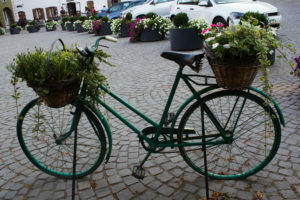 One day will probably suffice for exploring the cobbled streets by foot. From a total of 14 towers, 9 are still left standing around the citadel. These are the Clock Tower, Tanners Tower, Shoemakers Tower, Tinsmiths’ Tower, Butchers’ Tower, Tailors’ Tower, Furriers’ Tower, Ironsmiths’ Tower and Ropemakers’ Tower. 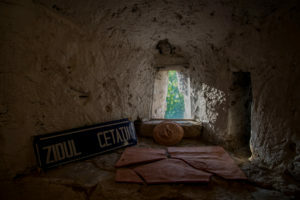 Although all of these had the role of defending the citadel, nowadays they have been converted to serve different purposes, from a museum to housing the local radio station and the home of the cemetery caretaker. 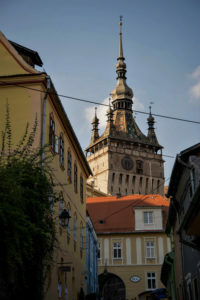 This is the symbol of Sighișoara and the most visited place in Mures county. 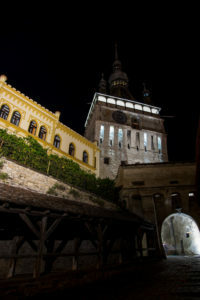 The Clock Tower is the most impressive of the 9 towers and it can be seen from almost every corner of the citadel. 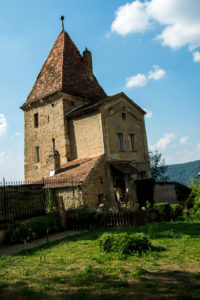 The main purpose of this tower was to defend the main gate against enemies. 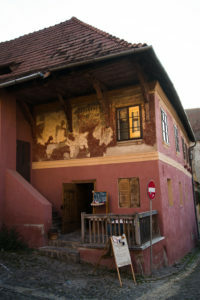 Until 1556 this also served as the City Hall. The clock was made in Switzerland and is decorated with 7 sculptures made out of linden wood which represent the week days. 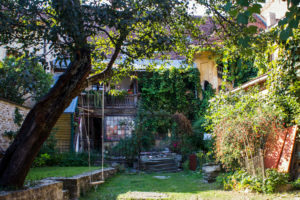 In 1964 the tower was upgraded to use an electric motor but it’s charm remains unchanged. 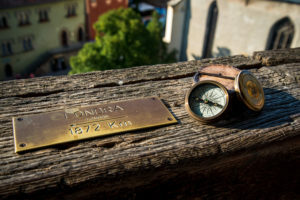 On each level as you climb to the top, there are different bits of the town’s history making up the History Musem of Sighișoara. 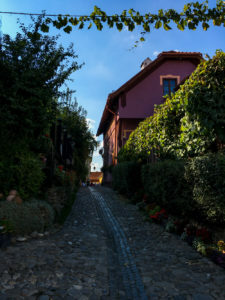 One option to get to the Church on the Hill is walking through the covered stairway which is also known as the “Scholars’ stairway”. This stairway was built in 1662 and it had initially 300 stairs after witch it was modified in 1849 to 175 stairs. 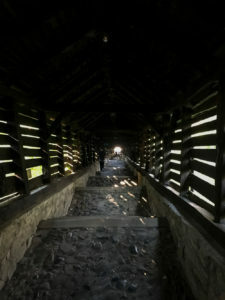 The foundation of this stairway is made of stone, the walls are made of wood and the top is made of shingle. The children used this route to get to school and for their protection the stairway was covered. During the night, walking through this stairway can be a bit spooky but that did not stop us from exploring. 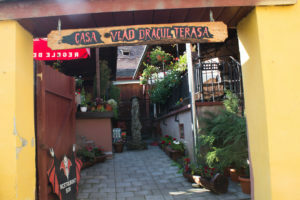 Vlad the Impelar, aka Dracula is known among tourists due to Bram Stoker’s novel. 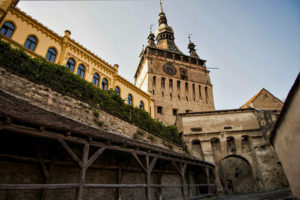 Even if he didn’t lived in Bran, this castle is one of the top most visited destinations in Romania. 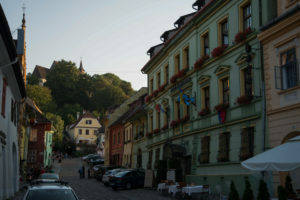 It may came as a surprise for you that Sighișoara is the birthplace of Vlad, his house being exactly in the town square. 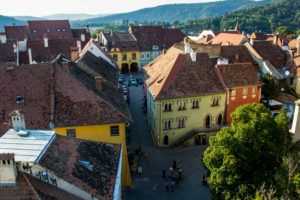 Being really well preserved and a prime example of Carpathian medieval fortifications, Sighișoara is a citadel worth visiting during your Transylvanian excursions. 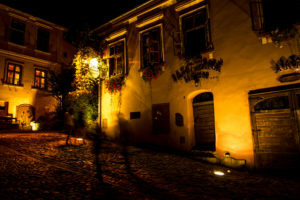 I bet celebrating Halloween in Sighisoara was an amazing experience for you guys. 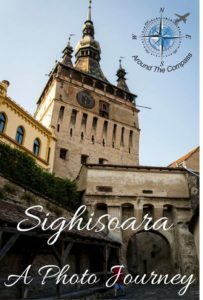 There is always a second time for everything so hopefully you will return soon to discover more about Sighisoara. 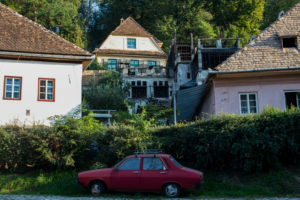 Paul and Carole, you will love Romania for sure. Hope you will get the chance to visit one day. 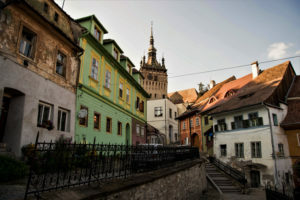 Sighișoara looks absolutely delightful! Its now on my list, thank you for sharing! 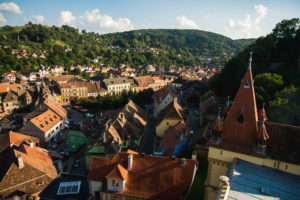 Hi Garth, glad you added Sighisoara on your bucket list. 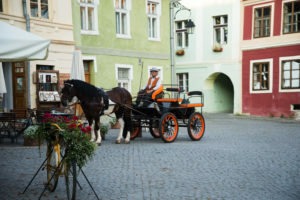 This town looks like it is straight out of a historic movie! I love how much history there is in Europe. 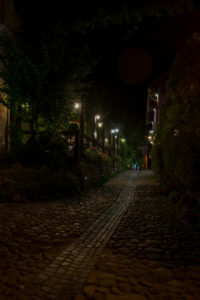 I am 100% certain I would love strolling the cobblestone paths and seeing the colorful buildings. Thanks for sharing your marvelous photos! 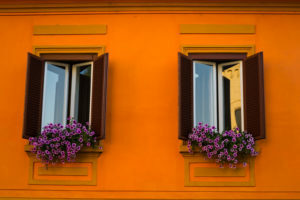 This is a lovely photo essay! 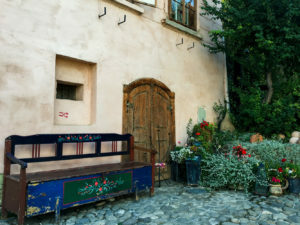 I really enjoyed seeing the pictures – the birthplace of Vlad Dracul and the street vineyards were my favorites! 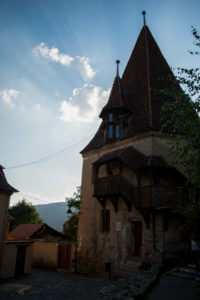 I never thought of visiting Romania but your pictures are very enticing. The town looks very interesting and a lot of history to be found. Thanks for sharing I will pin for future. Wow, absolutely stunning photos and it looks like an incredible place. 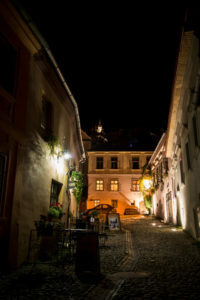 So timeless with its cobbled streets and preserved houses. 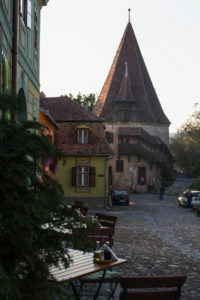 I have never been to Romania but I will definitely need to visit Sighisoara when I do eventually go. Love the clock tower and those amazing views! 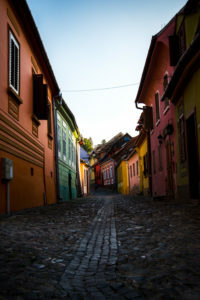 The photos are very beautiful, they capturle perfectly the colorful and medieval atmosphere of Sighisoara. 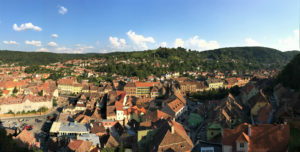 The view from the Clock Tower is a “classic” shot, as the tower is the town’s landmark, but nevertheless beautiful. Hi Luminita, glad you enjoyed our photo journey. The view from the tower may be a classic shot but is nevertheless gorgeous.